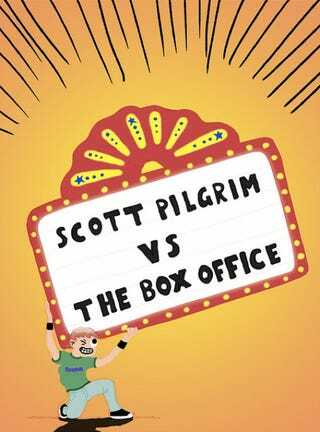 The first weekend box office earnings for game-infused movie Scott Pilgrim looked bad in isolation. Place them next to other gaming movies' debuts and they look even worse. This chart shows the opening weekend take for video game movies in the United States. As you'd expect, Tomb Raider, Mortal Kombat and Prince of Persia are up the top. But where's Scott Pilgrim? Well, he's further down...down below, well...Max Payne, below Hitman, below Doom and below...Gamer. Yes, Gamer - the Gerard Butler vehicle that was as awful as it was forgettable - enjoyed a better opening weekend than Scott Pilgrim. Going to show that an awful movie with a dreamy frontman will beat a decent movie with the kid from Arrested Development any day of the week.